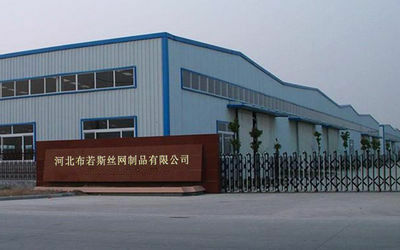 Hebei Bros Metal Products Co., LTD was founded in 2011, (Predecessor is BuRuoSi Metal Wire Mesh Factory) and we have many years of history in the metal wire mesh industry. We began to produce zinc steel fence-related products from 2003. After more than 10 years of development, Bros has become a professional manufacturer of Metal Wire Mesh which specializes in design, producing, sales for integrity. The company is located in Asia's largest industrial area of the wire mesh-- Anping County, Hebei Province, with convenient transportation access. Our main products include: Zinc steel fence, Driveway gate, Farm gate, steel fence rails and posts, Storage shelves, Triangle bending fence, Garden mesh fencing, Grassland mesh fence, Temporary fence, Palisade fence, Welded wire mesh panels, Chicken mesh, Barbed wire mesh and other products. There is one point I need to explain, we set up a branch office as well as warehouse in Adelaide, Australia several years ago. Australia is our major export market, with many clients there .And we maintain a good cooperative relationship with the Australia. Each year, our manager flies to Australia and visit customers several times. Thus, we fully understand and grasp of the Australian market. For example, we gain a great advantage in this shipment. It is very conveniently and quickly by LCL according to a small number of goods is shipped to Australia. In addition, we are also trying our best to develop more overseas markets. Our company regards "customer first, integrity-oriented",  " reasonable price, efficient production time and good after-sales service" as our tenet. We hope to cooperate with more customers for mutual development and benefits. Warmly welcome you and opening up the boundaries of communication. Since its foundation, this company has been always adhering to the principle of uncompromising integrity and credibility first in doing things. We are making our own Brand and has been exporting the zinc steel fence, Welded mesh, Farm fence , storage shelf, etc and other high grade protective products to over 50 countries and regions in Australia, Europe, New Zealand, America, South Africa, and Asia. Now, we have successfully taken and completed the orders from Australia and other countries which perfectly proved our good reputation and strong production capability. In 2013, our company continues to expand, building the new office and adding the welding workshop, purchasing new welding equipment .We have more than 300 employees, our annual production capacity is more than 15 million tons of wire mesh. QUALITY CONTROL- We have first-class product design department which is responsible for the research of new products; first-class quality control department which is responsible for supervising each production process and first-class sales staff to provide you with efficient services. Dedicated to strict quality control and thoughtful customer service, our experienced staffs are always available to meet your requirements and ensure customer satisfaction. In recent years, our company has introduced a series of advanced equipment including Gabion Weaving Machine, Welding Machine, and Packing Machine. Totally, ” quality of products in order to survive, credibility and development services”, we have continuously tried to improve product quality and high-quality service. PRICE- We promise that we can provide you a reasonable price after sending the specification of the products.The quoted prices will be valid for one month counted from the date of this quotation. Usually, the product price depends on the price of raw material. TRANSPORTATION –Transport by sea is the most important mode of transportation in the world today. Production of goods has been completed, ready to be shipped. We will deliver the goods safely to the designated port as customer’s request. PACKING – Normally, Our Company adopt standard export packing for the method of transportation. The metal mesh products must be well protected against dampness, moisture, rust. There are used in packing as below: Plastic film, plastic bag, Nylon bag, carton box, kraft paper, wooden case / metal pallet etc. We’ll pack the goods according to our clients’ instruction. ENTERPRISE PURPOSE -We wishes to create a bright future with customers on the base of equality and mutual benefit and sincerely welcome friends from all over the world to visit our factory. We look forward to being of service and offer a quality and friendliness that is synonymous with Bros.
Bros is a professional manufacturer of metal wire mesh which specializes in design, producing, sales for integrity. We have more than 300 employees, through the efforts of our entire staff, we have become a wire mesh manufacturer. We have continuously introducing good technical capabilities. Our annual production capacity is more than 15 million tons of wire mesh. Bros is the assurance and competitive strength of the company's long lasting progress and development. In order to create a wolf team, the company attaches great importance to personnel training and appointment of staff, and we provide a broad platform for our staff to display their own capability.